"When I was about 8 or 9 years old I had a pet tabby cat that I named Jennifer after a girl in my class who I liked." I know!! See? I'm not exaggerating!! 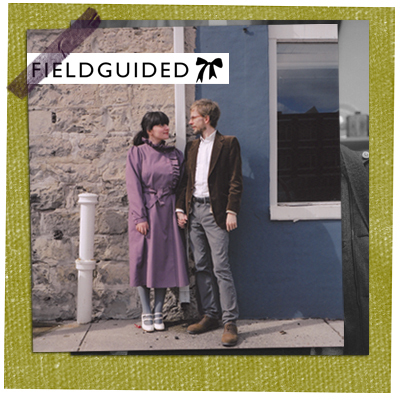 Please welcome Anabela & Geoff of Field Guided! We've been together for four and a half years, and engaged for three months. We met online, which was initially a slightly embarrassing fact, but we're over it. Anyhow, as is typical for Toronto, once we met we realized we had friends in common. I have an undergraduate degree in medieval studies, of all things. The first major art purchase I made was a piece by Sonja Ahlers. It cost $150 and it hangs in our bedroom. I read my horoscope (Capricorn) and Geoff's horoscope (Taurus) every month at astrologyzone.com. In 2003, I read an interview with Zooey Deschanel in Nylon in which she said that her high school experience made her feel "like a ghost passing through." That is precisely how I feel about my high school experience. I don't believe in "guilty pleasures." If something makes you feel joy, you should never feel ashamed of it, even if it's songs by Heart from the 1980s. 1. What would you say are the three most important things that you do to support Geoff in his creative endeavors? 1. I channel my more driven and workaholic tendencies into guiding our collaboration. We walk to and from work together, constantly discussing new ideas and ways to make things better. We email each other links and share items on Google Reader and swap images and create to-do lists for each other in Google Docs. It's like having a personal research assistant who knows precisely what your taste and your aesthetic is, and what you have to achieve in a day. That probably sounds a little intense, but it's become pretty natural and breezy. 2. I am learning how to be appropriately critical. I am not always good at constructive criticism; I worry that any sort of criticism will seem hurtful or negative. I know that Geoff would rather hear me say that I don't like something he's done than pretend that I do like it. 3. I acknowledge my weaknesses and Geoff's strengths. When I need a drawing to base an embroidery on, I can ask him to do it (I call him my "in-house illustrator"). If I need a photo edited in Photoshop, he'll do a better job at it than I will. I am the type of person who always wants to do everything herself, very stubborn and independent, so this requires a degree of trust. 2. Working closely with somebody you love can be tough. Any tips on how to avoid throwing ornaments and other sharp objects at each other? We haven't been doing Fieldguided for very long (since November of 2008), and the learning process continues. It's important to take an evening to do something frivolous together, such as going out for sushi or watching television without having an embroidery hoop or a pencil in our hands. We're happy to spend the evening stitching and drawing a few feet away from each other, though. We strive to ensure that our creative outlets remain a source of comfort. We're still enjoying the novelty and the excitement of working together. 3. What was the strangest thing you've done to support Geoff? We are heavily influenced by a sense of nostalgia and by vintage and antique things, and so hunting through thrift shops and antiques markets is an important part of what we both do. It's not exactly strange, but we've spent entire days driving across the city to visit a number of them. Sometimes it feels like a mania: how many more can we get to before closing time? 4. What is the easiest and hardest thing about being Geoff's other half? Geoff is the most sweetly supportive person I've ever known. If I'm feeling discouraged because I saw something on the internet that made me feel envious or awful about my abilities, or if my perfectionist streak kicks in and I want to undo hours of work, he is able to speak to me rationally and remind me of things I've forgotten. He doesn't get upset with me when I cry, which is good because I cry a lot! The hardest thing (although I have to admit that it's not really that hard) is that we work very differently. Sometimes I have to be less type A and acknowledge that his process is different, and that it's fine. He gets it done. 5. Please choose one of your personal favorite projects that Geoff has been involved in. I love to hear about the group art shows that Geoff was involved with when he was a student. He doesn't think much of them now, but I've asked him hundreds of questions about them and have demanded to see pictures from the openings. I'm so curious about the work he did before we met, because this early work helped make him who he is now. We first met in person the day before I began grad school. We had coffee then went for drinks. It was new and exciting and the start of something very special. Both Anabela and I have master's degrees in library science. The balcony of our current apartment faces the primary school that my grandfather attended in the 1920s. I think about Europe a lot, but I have never traveled there. Anabela introduced me to anchovies and prosciutto and now they're some of my favourite foods. When I was about 8 or 9 years old I had a pet tabby cat that I named Jennifer after a girl in my class who I liked. 1. What would you say are the three most important things that you do to support Anabela in her creative endeavors? 1. I've come to realize that we really feed off each other in ways that are difficult to articulate but that center around intuition. We can't explain how it is that we can work independently, yet have the things we make feel cohesive. 2. We pool our resources and we pick up the slack. If one of us doesn't have the money for materials one week, the other might have it. If one of us is working on a wholesale order and is too busy to make dinner or to wash the dishes, the other will do it. 3. We make sure that we eat well and take care of ourselves. If you're working closely on something for hours straight, it's possible to forget to eat fruit or to drink water. I love to make healthy lunches and hearty bowls of oatmeal for Anabela, and plan out our meals with the help of Martha Stewart Everyday Food magazine. What we struggle with most of all is time, of course. We have to take on side projects and part-time jobs in addition to working 9-5. Anabela catalogues for a rare book dealer and typesets books, and I build websites and content management systems. It can be difficult to find time to work on Fieldguided, and it often comes at the expense of other commitments (usually social ones). We still haven't figured this one out, and maybe we never will. This won't be a surprise, but communication, compromise, and basic consideration for one another are essential, especially when we're feeling stress from our work situations. 3. What was the strangest thing you've done to support Anabela? I started drawing kittens to make Anabela smile. Because she encouraged me to continue with it, I ended up drawing kittens onto mugs. I genuinely enjoy it but when I stop to think about it, drawing kittens is something I would never have predicted I would be doing. We do laugh about it. By branching out like this I've discovered a new approach and new ways to drawing that inform everything else I make too; I feel more adventurous now. 4. What is the easiest and hardest thing about being Anabela's other half? Even if we don't agree on everything when it comes to taste and opinions (I like the British archaeology show 'Time Team,' Anabela likes catching up on 'Gilmore Girls' episodes on DVD), I feel as though we're on the same page in terms of personal passions, goals, and general outlook. I love her dearly and feel happiness and warmth whenever I see her. I tend not to express my frustrations and anxieties as outwardly as Anabela (i.e. when I'm stumped over a project or feeling unsure about the quality of something I've created), though I nearly always empathize with her and try to encourage her through challenging situations. 5. Please choose one of your personal favorite projects that Anabela has been involved in and briefly explain why it is your favorite. I suppose this is more of a two-part answer, but I remember early on in our relationship Anabela confessed to me that she felt impressed by my artistic background and activities, and that in turn she felt disappointed for not having her own creative outlet. Now the situation has changed so much. About a year and a half ago Anabela took a sewing course and I think that sparked her current output and our collaboration. Secondly, I'm impressed with how Anabela has managed to make connections and build such strong bonds with distant (and not-so distant) people she has met online since she began regularly blogging at http://fieldguided.blogspot.com. Finding a way to feel connected to other people is extremely valuable, and in her case, I feel that these connections she's made have inspired her and contributed in a very positive way to her sense of self. Do you have an incredibly supportive partner that deserves a little attention?? If so, email me at hearthandmade@gmail.com. Well, first off~ I adore fieldguided and secondly..these two are absolutely adorable and clearly very well suited! What a pleasure, and now? I love fieldguided even more! :)Thanks guys! It's so nice to learn more about Anabela and Geoff. I follow the Fieldguided blog and am a great admirer of everything they make. But this interview makes me feel that much more appreciative of what they do! excellent post, i love these two! These are always so sweet. I love these features. anabela and geoff are some of my favorite etsy/internet-ers. so, so wonderful! i loved the article. what i love most about these two is that they are so incredibly sweet, yet still not at all cloyingly so. a true team if ever there was one. I have been outed as a Gilmore Girls fan! Yes, it's true, I love that show, and chances are that everything I've sewn by hand in the past month has been sewn to the tune of Rory and Lorelai's chattering. Awww sweets! Anabela and Geoff are so good together! Cutest couple ever! Thanks again for being a part of this column Anabela and Geoff! & Valerie I totally agree with you.